I don't remember ever being offered an alternative to tampons or sanitary towels. I went to an all girls' school and recall having a very nice woman come and give us the "period talk" when I was about 12. She gave us all a goody bag filled with different sized tampons and towels which I thought was very kind and I assumed that she was a sexual health teacher. What a sucker. In hindsight she was clearly a rep ensuring that another generation of women would default to her company's products during their period years, similar to the formula companies that used to prey on new mothers in hospitals. Well played. I'm surprised that I never questioned it. I questioned everything else I was told as a teenager! With the "tampon tax" being everywhere in the news at the moment, I started thinking more about why I used tampons and hadn't chosen another, more sustainable option. In short, it was what my mother used at home so I assumed that it was the only option. Standard. The BBC have now published a Tampon Tax Calculator where you can see an estimate on how much you have already spent on sanitary products and how much of that is VAT. My results suggest that I will have spent nearly £1800 on sanitary products by the time I reach the menopause...and then there's the environmental impact of using these products which once I start thinking about I can't shake off the guilt at the amount of waste. So at the age of 35 and after 2 children I have finally decided to explore my options. Late to the party as always! 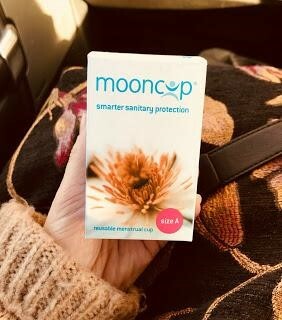 After a bit of research I decided to give the Mooncup a whirl, which was a favourite with the so called "crunchy Mums" in the breastfeeding groups I frequented when the babes were younger. What the eff is a Mooncup I hear you cry?! Well it's pretty much what it says on the tin; a soft silicone cup that you insert into your VJ which collects menstrual blood. It had always sounded a bit too much like hard work but now I'm willing to give it a bash. ● Latex-free, hypoallergenic and containing no dyes, perfumes, BPA, phthalates, plastic, bleaches or toxins. ● Made from soft, medical-grade silicone you apparently won't know it's there. ● While tampons absorb 35% vaginal moisture, the Mooncup won’t dry you out or leave fibres behind. ● Holds 3 times more than a tampon and can last for up to 8 hours. ● Money saving. Mooncups cost approx £20 depending on stockists. ● Environmentally friendly. No more waste. This is by no means an ad for Mooncup but their customer support is INcredible! I obviously had a long list of questions before purchasing which an oh so patient advisor helped me through before finally ordering. When it arrived I was massively surprised by how small and inoffensive it was, then swiftly went to experiment in the office loo. Totes appropes. If you're of a less brazen nature, maybe have a practice at home until you're confident that you have it down! I was all geared up to get stressed out inserting it for the first time but thanks to super helpful instructions on the website and packaging it was easier than my first dalliance with tampons. No leg up on the toilet seat with a mirror in one hand this time! I literally folded it, folded it again and popped it in where it opens and makes a seal to collect the blood. Much better. One thing I did have to do is snip the stem, (carefully!) nearly all the way off to get the perfect fit as I'm quite petite but it's different for everyone. So it's in. And now all I have to do is wait. I have no idea if I have it in correctly and immediately panic and check online forums, (of which there are many!) for tips. I feel reassured by all the long time users guides and so I decide to put the Mooncup through it's paces. It survives a day in the office, (I was weirdly worried about what would happen if I sat down. Would it fold up?!) a brisk dog walk across the Malvern Hills, a run and even a Pilates class. I very nearly bottled it before the Pilates class as it's full of squats and lunges which would not end very well if it didn't pass the test, BUT it did! No leaks, no dramas and I couldn't feel it at all. I felt brave enough on day one to empty it in the public loos at the gym which was my main worry when looking at it. I mean, what do you actually do with it?! How do you deal with emptying it in a public bathroom? Well you do exactly what you think you would! Empty it down the loo, give it a rinse if you're in a bathroom where you can or if not just give it a quick wipe with tissue and pop it back in. It really is that easy. I'm going to be honest...if you're very squeamish this probably isn't for you. I had never actually seen my period blood properly and was absolutely fascinated, (there are even volume measurements on the cup!) but it's not everyone's cup of tea. It's a yes from me. Using a menstrual cup take a bit of adjusting to and the folks at Mooncup suggest giving yourself three cycles to get used to it. I've used it for just one and am converted. I feel like I'm doing my bit for the environment, feel much more connected to my body as well as saving some much needed pennies. For more information check out Mooncup's website here.